(Nov. 2, 2018) – On Veterans Day, officially recognized on November 11, Americans remember and honor all who have served in our nation’s military. UTSA also honors their patriotic commitment and sacrifices of safety, comfort and well-being, as well as that of their families by hosting a series of events this month that are open to the UTSA and San Antonio communities. UTSA’s military community includes nearly 5,000 veterans, active duty, guard, reserve and their family members plus ROTC, in addition to more than 400 faculty and staff who have served. 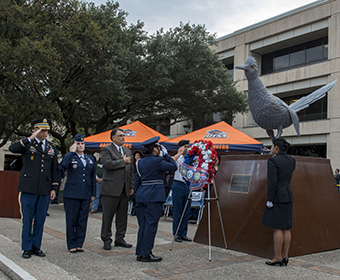 >> Learn about all the ways UTSA is helping its military community. The UTSA Office of Veteran and Military Affairs will host the Women Vets of SA for a luncheon and discussion on the challenges women veterans face transitioning out of the military. The panel will feature veterans from the Women Vets of SA organization and be moderated by Jessica Gonzales, Coast Guard veteran and UTSA student conduct coordinator. Lisa Carrington Firmin, retired Air Force colonel and UTSA associate provost for veteran and military affairs will give a brief introduction highlighting the multiple identities and intersectionality of women veterans. This event is in partnership with the Student Center for Community Engagement and Inclusion and the Office of Veteran and Military Affairs. Selected facilitators in small table format will lead discussion about veterans to help educate others about the unique veteran culture; using lived experiences to help clarify both myths and facts. Everyone is encouraged to participate in the discussion, even those who are not veterans or military as this event can also serve as cross cultural competency education. In February 2014, a group of amputee veterans set forth on a monumental goal for recovery, to climb the world’s tallest free-standing mountain: Mt. Kilimanjaro (19,341 feet). Consisting of six amputees and five wingman climbers, the Kilimanjaro Warriors hiked the mountain for eight days overcoming insurmountable obstacles and new challenges with each passing mile; trusting that if you have heart and believe in yourself, anything is possible. In partnership with the Vet Success on Campus Counselors and the Office of Veteran and Military Affairs, several veteran service organizations will provide information and awareness of resources available to UTSA students, faculty and staff who are veterans. The UTSA Army and Air Force ROTC programs will be in formation and perform a pass and review parade. The featured keynote speaker is David Lenderman, retired Air Force Colonel and former deputy chief of the Air Mobility Requirements Division. A reception follows the ceremony in the Student Union Ski Lodge. UTSA is proud to honor military veterans, first responders and their families during Heroes Day, featuring an ROTC Joint Honor Guard and a special halftime show. UTSA will also recognize heroes throughout the game. Prior to the football game, UTSA Veteran and Military Affairs will be hosting a tailgate, in Alamodome Lot B, beginning at noon. All military affiliated Roadrunners, and their families, are welcome to attend. Food and non-alcoholic beverages will be provided. San Antonio Entrepreneurs Week is a celebration highlighting entrepreneurs and the businesses that are creating positive changes and economic development in the community. Through a six-day showcase of the various industries that make San Antonio unique, the goal is to inspire others to take the leap, educate themselves and find the support they need to start or grow. Each day of SAEW is thematically planned to provide direction for attendees. The theme for Monday, November 12 will be a showcase of the fundamental business elements needed for successful start or growth of a venture, with an emphasis on elevating veteran entrepreneurs. Learn more about UTSA’s military community. Learn more about the UTSA Office of Veteran and Military Affairs or email at veterans@utsa.edu.